June is a highly experienced clinical psychologist and cognitive therapist who has worked in the NHS for over twenty years. As recently appointed Director at Oxford VR she brings together in-depth knowledge of psychological treatments and experience of leading NHS services in order to promote the widespread uptake of immersive technology to treat a wide range of psychological problems. She has worked as a therapist, researcher, supervisor, trainer and manager of psychological services. She was Clinical Lead for the primary care and specialist psychological services for adults in Oxfordshire and led the development of TalkingSpace Plus, Oxfordshire’s IAPT (Improving Access to Psychological Therapy) service until 2016. June has particular interest in treating depressive disorders, treating doctors in difficulty and developing services. In 2017 June started work with the Charlie Waller Memorial Trust as Director of their Workplace Programme. 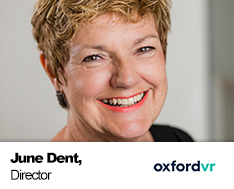 CWMT is a mental health charity and, alongside her Oxford VR role, June leads their work to promote positive mental health and wellbeing at work.